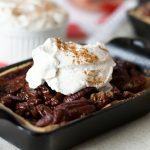 Abuelita chocolate pecan pie isn't overly sweet and has crunchy pecans that are nestled in a chocolate sauce with warms notes of cinnamon. Preheat Oven to 350 degrees. Place Mixing bowl and Whisk attachment in the freezer to get it cold. Remove refrigerated pie dough and allow to get to room temperature. In a small pot melt butter, then add brown sugar, and break up the disc of the Abuelita Chocolate. Stir the chocolate into the butter and sugar until melted. Add Agave, Vanilla, and Salt. Combine well, bring to a low boil for about 2 minutes, then remove from heat to cool for 10 minutes. While mixture is cooling, setup up mixing bowl for whipped cream. Place heavy cream, cinnamon, vanilla, and powder sugar into bowl and beat with an electric mixer on medium high speed until soft peaks form. Place in a covered dish in the refrigerator. Place refrigerated pie dough into a 9 in pie dish. If using smaller ramekins, cut pie dough to fit each ramekin. Beat the 3 eggs together and then pour into the cooled chocolate mixture. Stir until combined and add the pecan halves and pieces, stir well. You can save some pecan halves to place on top to make it look pretty. Pour mixture into pie crust and bake for 45 min or until a toothpick comes out clean. If using smaller ramekins decrease baking time to 20-25 minutes, or until a toothpick comes out clean. Allow pie to cool and serve with chilled Cinnamon Whipped Cream.